This past Saturday, folks, was a big day for the Council on American-Islamic Relations. Its "Leadership Conference & 18th Annual Banquet" at the Marriott Crystal Gateway Hotel in Arlington, Va. lasted from 9 am until past 10 pm. CAIR Leadership Conference & 18th Annual Banquet is/are private CAIR event(s) and CAIR reserves the right to refuse admittance to anyone for any reason. 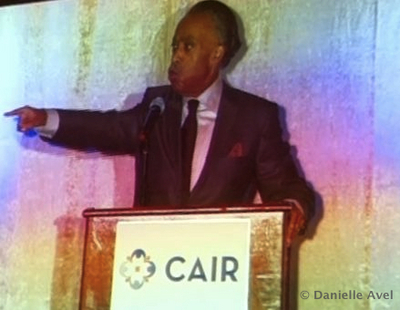 CAIR also reserves the right to eject anyone from the private event(s) for any reason. Rejected guests will not receive a refund for their tickets or be compensated in any way for their loss. All audio, visual and audio/visual devices and photography, filming, recording and taping are strictly prohibited. 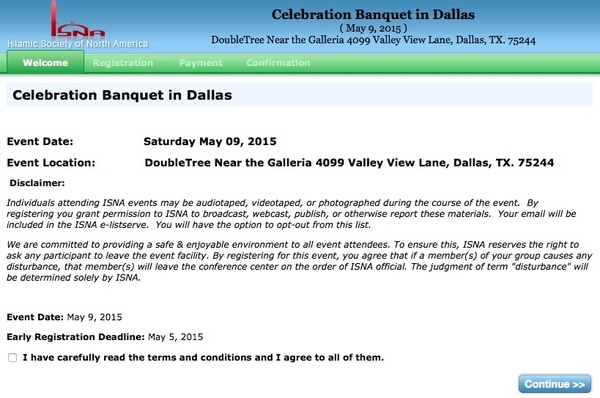 Screenshot of CAIR's warning to those about to purchase a ticket to its annual dinner. (1) That warning is not a one-time thing but CAIR's standard legalese; for example, it used precisely the same wording for its 2011 conference & banquet, as can be see quoted here (search for the word "disclaimer"). (2) Paraphrasing Bob Dole, "the most dangerous place in Washington is between CAIR and a television camera." Why, then, the sudden shyness from a publicity hound, strictly prohibiting "All audio, visual and audio/visual devices"? Because live events have unscripted moments and CAIR, I suspect, shudders at a random Islamist wandering off the reservation. Its own chairman did this in 1998, announcing in public that "Islam isn't in America to be equal to any other faith, but to become dominant," a burst of bluntness that still today impedes CAIR. (3) CAIR's disclaimer brings to mind the flap in 2003 at the University of Toronto. Al-Awda, an anti-Zionist group that seeks to eliminate Israel by flooding it with Arabic-speakers, required that all those attending its event sign a spooky "Basis of Unity" statement. In other words, it demanded that all participants subscribe to Al-Awda's beliefs, including "We support the right of the Palestinian people to resist Israeli colonialism by any means of their choosing." Hey, CAIR, I'm offering you this idea gratis. (4) CAIR does have reason to worry about opponents infiltrating its events. Not only did Chris Gaubatz spend six months undercover in CAIR's Washington headquarters but, more on point, in at least one instance an anti-Islamic activist attended a CAIR event in disguise. That would be Debbie Schlussel, who donned a tight black hijab, presented herself as "Zainab Salih," and went to a town hall meeting for political candidates in Detroit on Oct. 10, 2004, only to be recognized as herself and called out. 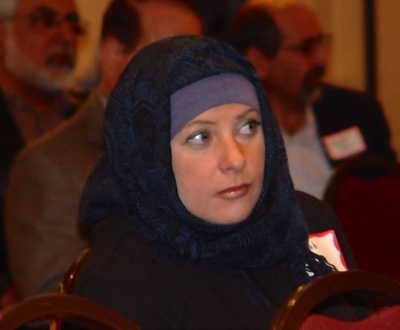 Debbie Schlussel at a CAIR event in Detroit in October 2004, as her name was called out. (5) I don't know if CAIR has actually expelled someone who bought a ticket but David Gaubatz (father of Chris) reports that it had him blocked from attending an Islamic Society of North America event in 2009. As Gaubatz explains, four days before the ISNA conference, CAIR's attorney "contacted me with a threatening letter demanding that I not attend the ISNA Conference in DC"; and ISNA, which had sent him a confirmation number and welcome letter, in fact did not let him in. (6) CAIR's reserving the right to deny someone entry to the event, without compensation, "for any reason" appears to be legal. But it's unheard of for an outfit claiming to be a human rights organization. This blatant thought control reflects CAIR's origins in Hamas, the totalitarian Palestinian movement, and points to how Islamists threaten a free society – in addition to their primary effort to apply the Shari'a, a medieval law code. The Hibbing Area Women's Retreat featured a keynote by Cynthia Khan, a convert from Islam to Christianity who was to talk about that as well as the needs of refugees and new immigrants, the history and basics of Islam, women in Islam, and her conversion. the Council on American-Islamic Relations, Minnesota (CAIR-MN) claims that a Muslim woman who attended the event reported that she was welcomed, asked to leave, then physically escorted out of the church during the retreat. ... CAIR-MN states that the woman, identified as Rania Elsweisy, registered and paid for the event and was given a name tag. Elsweisy claims that Khan asked volunteers to remove her and they did so following an exchange of words. Elsweisy told CAIR-MN that Khan said that she planned to show videos and distribute materials that may be offensive to Muslims. She replied back to Khan, stating that she was there only to listen and would not interrupt. 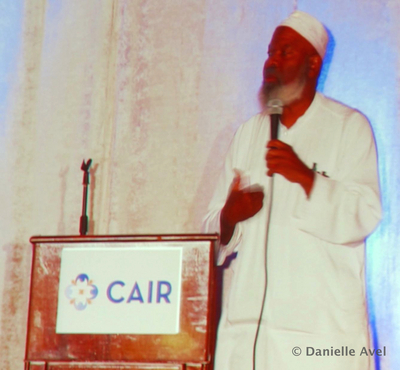 CAIR-MN Executive Director Lori Saroya charged that retreat organizers engaged in discrimination when they prevented Elsweisy from participating in the event, while opening it up to the rest of the public. "We ask all community leaders in the area to repudiate the unfair treatment," she added in the release. Rich, no? Even as CAIR reserves the right to throw anyone out of its functions for any reason, it raises a stink when a Christian group exercises this exact same, legal prerogative. Fox News, TheUnitedWest.org, Freebeacon.com, and many other American citizens were banned from attending Stand with Mohammed event organized by the Council on American Islamic Relations (CAIR) in Garland TX. Two reporters for TheUnitedWest.org, who purchased tickets in advance, were threatened with arrest and imprisonment by the police if they tried to report on the event. Comment: Noteworthy that CAIR can threaten imprisonment. Who gave it such powers? Or did it just arrogate them to itself? ISNA reserves the right to ask any participant to leave the event facility. By registering for this event, you agree that if a member(s) of your group causes any disturbance, that member(s) will leave the conference center on the order of ISNA official. The judgment of term "disturbance" will be determined solely by ISNA. Every attendee will be subject to a thorough security screening upon entry to ensure safety at the event. Weapons, including knives, will not be permitted. Every attendee must bring a valid picture ID to the event.